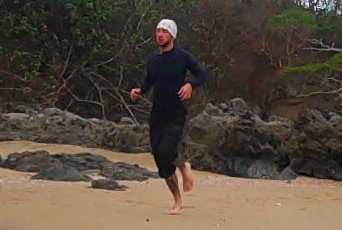 The beach is a great place for barefoot running. I’ve run many races over the years, usually wearing high-tech sneakers and my heart rate monitor, while meticulously selecting the best running playlist for my iPod. When I run the Brooklyn half marathon next month, however, I am going to try something new; I’m planning to leave all those things at home. A few months ago I made this post about running sneakers, in which I proposed that high-tech footwear was ideal for safety and performance. However, I have since come to reconsider my opinion on the matter. I’ve been a proponent of forefoot running for a long time, but my recent experiments with barefoot running have led me to realize how highly cushioned shoes decrease your ability to sense the way your foot is landing; this is potentially the root of most running injuries. Of course barefoot running is great if you’re on the grass or the beach, but I’ve even gone barefoot at the track. I still prefer to wear something on my feet for road-running, but it doesn’t need to be anything fancy–just something comfortable and lightweight. In fact, the less cushioning the better. The same way that wearing thick gloves will decrease your dexterity with your hands, wearing overly cushioned sneakers can make your feet heavy and clumsy. I'm planning to run 13.1 miles in these! The reason so many people tend to get running injuries is more often poor form than poor footwear. Running barefoot or in minimal footwear will quickly improve your running form for the simple reason that bad form actually hurts when you don’t have an inch of padding under your feet. While that padding can be enough to desensitize you to the impact, it isn’t enough to protect your joints. Thin soled shoes will force you to be light on your feet, which will likely improve your speed as well as your safety. 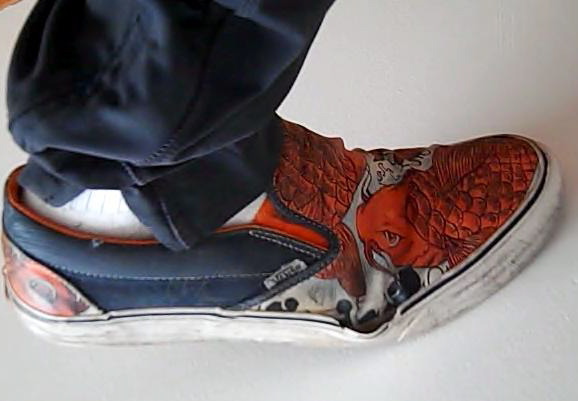 Lately I’ve been running in Vans slip-ons, a casual sneaker that almost feels more like a slipper. They are very comfortable and as an added bonus, I don’t ever have to worry about my shoelaces coming untied! I might get some weird looks at the start line for the Brooklyn half, but I’ve never been one to let that bother me. I agree 100% that most running shoes actually do harm to the feet/body. I'm also a big fan of being barefoot when it is practical. When it is not practical (on the road), I find the best choice for footwear to be the Vibram FiveFingers. These things are incredibly comfortable and versatile. I've worn them on road runs, in the rainforest, in the ocean, and other places. So far these have been the best, most natural feeling shoes that I've ever worn. I have a friend who wears FiveFingers when he runs, and swears by them. I haven't yet dropped the cash on a pair of Vibrams. I alternate between my regular running shoes and a $9 pair of water shoes, also known as aqua socks. They are great for running in the rain through the soggy grass along the side of the trail. They work best without socks and you can find them at your local big box mart. Hey Michael–thanks for the suggestion on the aqua socks. I think Vibrams were originally designed as water shoes, but then people started running in them so they changed the marketing (and the price!). If too many people start to find out about aqua socks that $9 price tag might suddenly turn into $99. I just read your review of the Invisible Shoe – it looks really interesting. I will admit that I've never found a comfortable sandle-like shoe that I could use for running, but that's not saying that my mind is closed to the option. If I see them I will probably give them a try, but at this point my FiveFingers are serving me rather nicely. Keep the good posts coming, I love the minimal workout style. Thanks David. Glad to hear you're keeping an open mind. I don't think Invisible Shoes are in stores yet, but if your curosity gets the better of you, they ship quickly and the customer service is great when you order them direct.